Probably the best reunion so far. More pictures on page 2. A special thanks to Rick and Darlene Hevner for orchestrating a wonderful reunion. It isn’t easy to put together a 9-hour party for approximately 50 people. You'll see from the pictures that they did a great job. 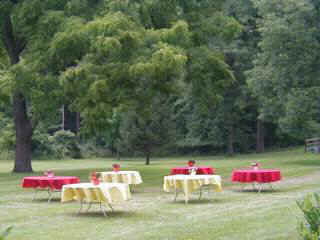 Rick, Darlene, and Michael prepared a wonderful menu: salmon, roast beef, salads, desserts, etc. Their efficiency gives the impression that they entertain large numbers of people at least once a week. If you weren’t there, you’ll have to wait for the pictures to fully appreciate the work they did. You can still visit the planning page for the reunion at Millennium Reunion 2000 for the list of those who planned to attend and the contests. 11 classmates contributed $760.63 to the class fund. This brings the account total to approximately $1,164. I will start posting the amount on a regular basis. If you didn’t have a check with you, and you still want to make a contribution send a check to either Rick or Sandy. (Please make it payable to Sandy Sorkin, Penncrest Class of 1963.) All of the proceeds will be used to offset the costs of the 40th Reunion. Check our home page for the current balance. Another thank you to Penny Ostrander Miecznikowski for the music. She compiled enough of the old songs to keep toes tapping and bodies swaying into the evening. To her credit, she did it the old fashion way without Napster. A few of us want to apologize to her because we forgot to tell her we had access to the satellite and digital music channels. The first few pages of pictures are from Penny who had her digital camera at the reunion. Jacque Fox's pictures are posted on pages 8 and 9. He has an incredible camera that takes very high resolution photographs. If you want full size pictures for printing, send me an email (Sandy@Penncrest.com) and I will send the actual picture file. Sandy smiling and Larry Howard's wife looking the other way. Probably an Oklahoma day dream. Rick Hevner explaining why he doesn't want any of us playing on his wall. Sandra Henzel Tinsley receiving the brunt of the lecture. He changed his mind after he finished the drink. Larry Howard, Tish Turner Mayo, Jim Scholten, Jacques Fox and miscellaneous backs. Jay MacLaughlin, Bobb Courtman, Jerry Stretch, and Dave Hodges. In the foreground, Louise Arters and Elaine Castagna. You should know the names of the others in the picture by now. Larry Howard and Jim Scholten discussing the proper placement of name tags. 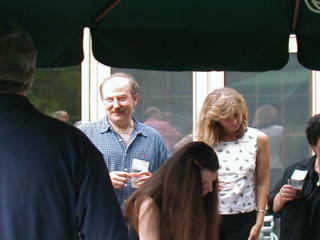 Sandy Sorkin, Helen Essaf Cogley, Rick Hevner and numerous backs.